Well I'm really getting into this painting thang. 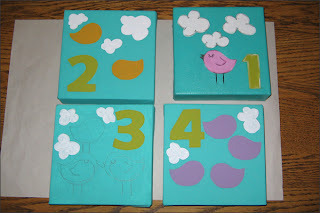 I finished up my 'A', 'B','C' and 'D' paintings and am now working on a '1', '2', '3' and '4' series. 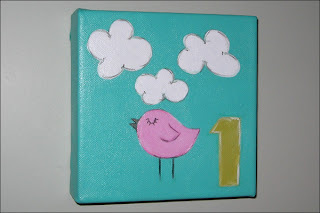 I've got painting '1' done with a cute little pink bird. Yesterday I started adding my layers of paint to all of the canvasses. I'm hoping to get this series done later today after I do some 'real' work. 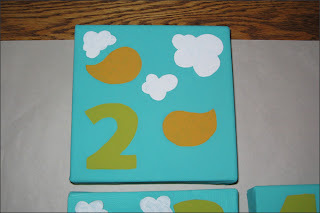 Next will be painting '2' with cute little orange birds. I also plan to start taking advantage of those 40% off coupons for Michaels then I can get a stockpile of cheap canvasses. I paid $20 for a pack of four 6" x 6" canvasses so each canvas costs me $5 plus painting supplies. If I can pay under $5 per painting for the canvas and supplies that would be great! 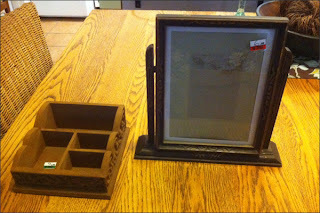 Tomorrow afternoon I'm going to sand and oil my latest thrift shop finds. I love the frame - it's very art deco. Instead of painting it, I'm going to sand it down and see how it looks au natural. I would actually love to make the frame a mirror if I can find the right size mirror for it. I love both finds - the desk organizer was $3.99 and the frame was $6.99.